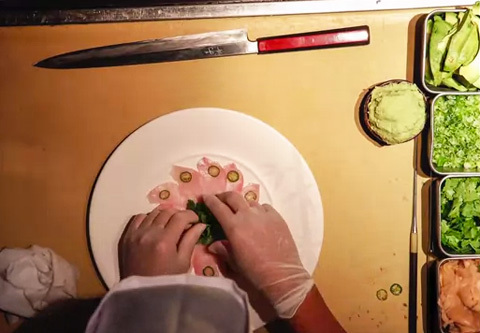 Watch the sushi chefs' skilled knife work and masterful technique. It's spellbinding. If you’ve ever been to Japan, eaten at a high-end sushi bar, or watched Jiro Dreams of Sushi, you know that sushi-making is an art form. In Japan, the industry requires years of mopping floors and washing dishes before an apprentice is even allowed to touch rice (let alone make sushi). Watch the video, then go read the Vanity Fair interview with legendary chef Nobu Matsuhisa; in it, the chef discusses the time his very first NYC Nobu restaurant was robbed, and tells the story of the robbers putting a gun to the back of his head. Very real. Now, go make a lunch reservation at Nakazawa.